You probably think of Cyprus as being sunny and warm all year round. We do have the sun. But we also have snow. 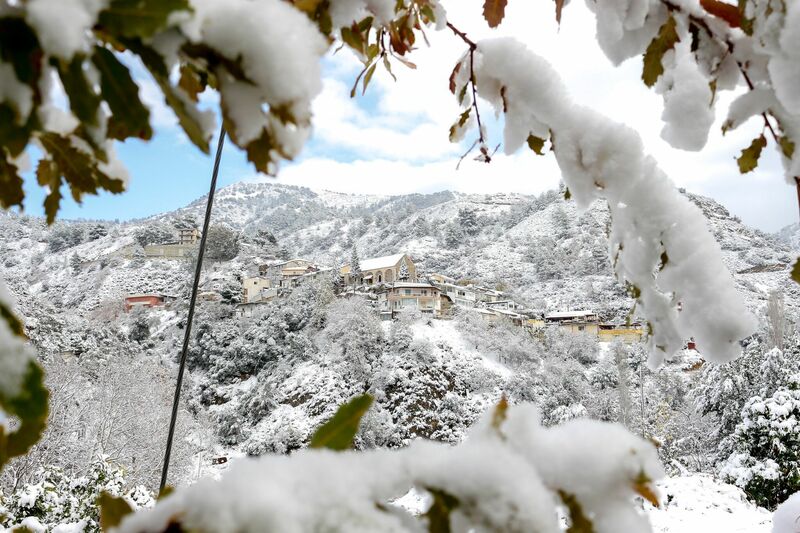 And fingers crossed it will snow this year, as there’s nothing more beautiful than a White Christmas at Casale in the middle of the snow-topped Troodos mountains. And now that it’s officially December, we can really get excited about the Christmas countdown. For us, it all begins on the 9th when we turn on the festive lights. The village comes together for hot mountain tea and gingerbread cookies, complete with Christmas carols. Santa Claus is always somewhere to be found in Kalopanayiotis, although to guarantee you get your present list to him, make sure you turn up to the annual village cultural committee celebrations on Christmas Eve. It will be a magical night, especially as the village choir will provide the soundtrack to the evening. Afterwards follow the sound of the saxophone and it will lead you to Byzantino restaurant, where a feast awaits: herb-crusted lamb chops with dried cranberries; Roast tenderloin of beef served on wild mushroom ragout with thyme sauce; gnocchi with light white-wine sauce and wild forest mushrooms... The buffet has something for everyone. Obviously don’t stuff yourself too much as you will have no room for the stuffed turkey on Christmas Day. We are very excited to have a live band joining us that can play all our favourite Greek songs, old and new. You might want to practice your Greek dancing moves in preparation, as the atmosphere is sure to be merry and after some local wine you will probably want to show off your Kalamatiano. You will have exactly 24 hours to recover, because the fun doesn’t stop there. We’re having a movie and popcorn night on Boxing Day, and don’t forget to stop at our ‪outdoor Christmas corner too, for more festive treats. Opposite the lounge-library there will always be someone on standby with a hot cup of mulled wine, marshmallows and roasted local chestnuts. Then come new year’s eve, the party starts all over again! We hope that you can join us over the holidays and share some happy and fun-filled moments together. We’ve had a fabulous time this year meeting new people and welcoming guests to our precious village. As each year passes, more people arrive, more life is breathed back into Kalopanayiotis and the luckier we are. So this year we raise a glass to you. Happy holidays! And thank you for all your ongoing support. We wouldn’t be here without it.